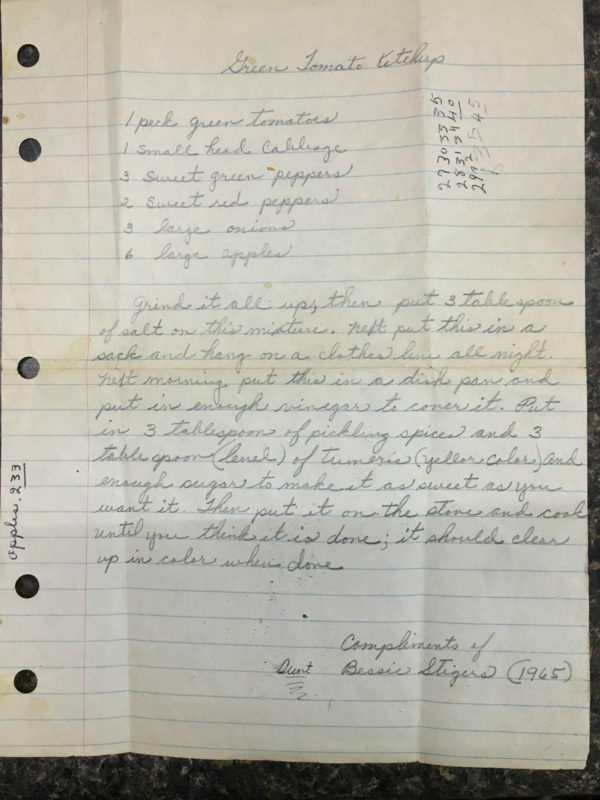 This recipe was found on a piece of notebook paper tucked into the pages of the Farm Journal Freezing & Canning Cookbook. Not a lot is know of the cookbook because the frot cover and first sixty-four pages are missing. Grind it all up [tomatoes, cabbage, peppers, onion, and apples only], then put 3 tablespoons of salt on this mixture. Next put this in a sack and hang on a clothes line all night. Next morning put this in a dish pan and put in enough vinegar to cover it. Put in 3 tablespoons of pickling spices and 3 tablespoons (level) of tumeric (sic) (yellow color) and enough sugar to make it as sweet as you want it. Then put it on the stove and cook until you think it is done; it should clear up in color when done. ← Mortgage? Wow, what a process.